PRESS RELEASE: It’s the annual Chaparral Motorsports Side by Side Expo on Saturday September 8th! During this huge sale you’ll find everything you need to hit the Glamis dunes or explore offroad trails in your side by side. From parts and accessories to get you ready for sand season to brand new vehicles ready to roll, this free event has something for every UTV fan. 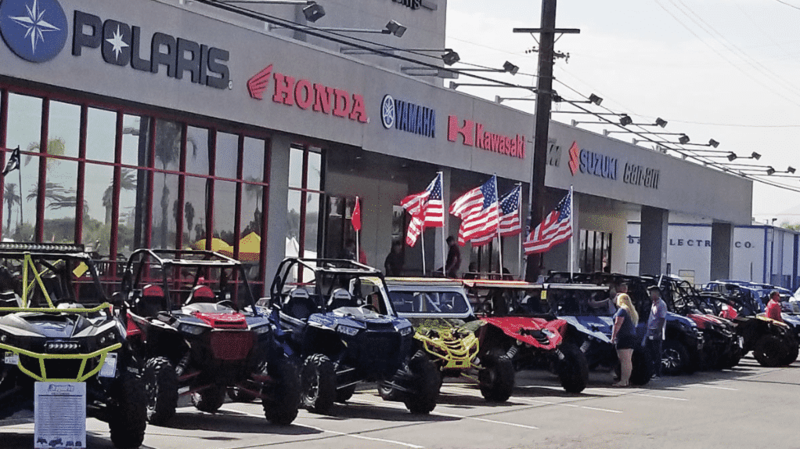 With a massive selection of the latest side-by-sides from Polaris, Can-Am, and Yamaha as well as full customized turn-key vehicles outfitted with nothing but the best components, if you are in the market for a new RZR, Maverick X3, or YXZ1000 the Side by Side UTV Expo is the place to be. 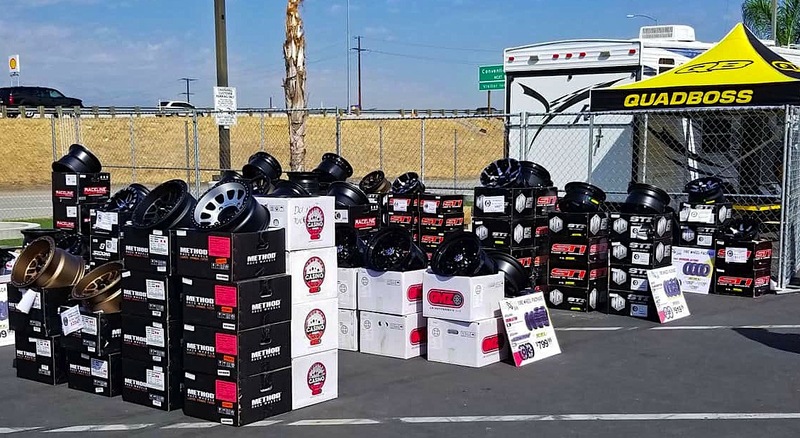 The event will kick off at 9am and run until 3pm with the majority of the festivities taking place in the massive parking lot in front of Chaparral Motorsports in San Bernardino. 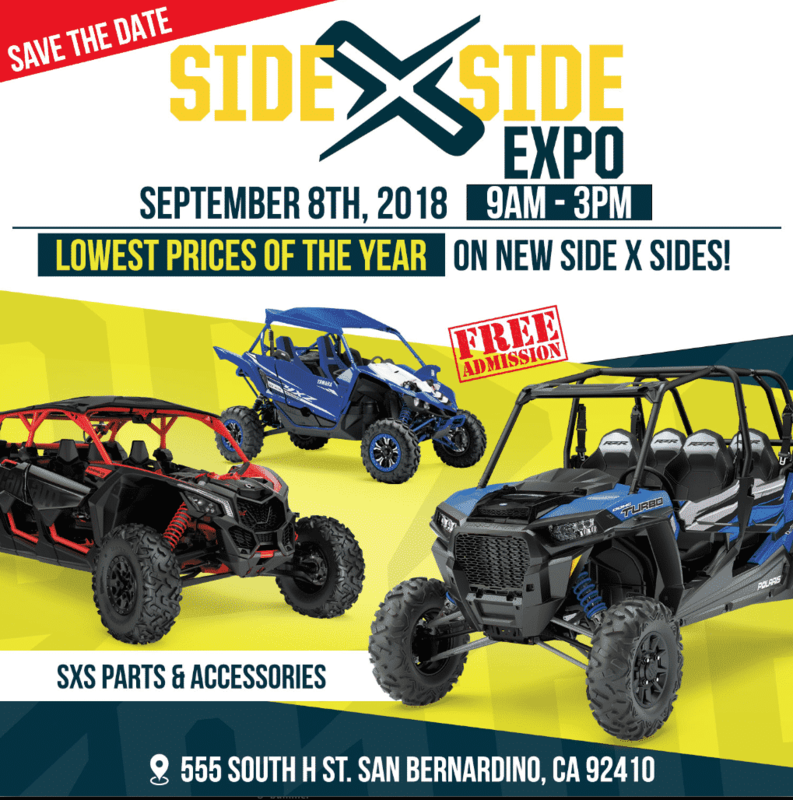 As one of the largest side by side tire dealers in the country, the Chaparral Motorsports Side by Side Expo will have great deals on sand tires with all the top paddle tires marked down to unbelievable prices. No matter if you are looking for one rear tire, two front tires, or need to outfit all four corners of your vehicle with new tires and wheels, there will be ton of mix and match options to choose from. Also on hand will be top name vendors showcasing hot new products and offering great deals on things like harnesses, lighting, whips, audio equipment, and more. Inside the massive 160,000 square-foot megastore store you will find OEM parts, deep discounts on helmets and sand goggles, and as well other gear and accessories you may need to get the family ready for some four-wheel offroad fun. Check out the commercial here. No parking fees, no entry fees, just walk on up to this free event and shop to your heart’s content. When you get hungry or thirsty there will be a taco stand on site to refill your tank. The family friendly Chaparral Motorsports Side by Side Expo will be a great way to spend a Saturday and will help get you excited for sand season. Located at 555 South H Street in San Bernardino, CA, 92410; no matter if your favorite place to play is Dumont Dunes, Stoddard Wells, Hungry Valley, the San Bernardino National Forest, or Glamis, Chaparral Motorsport s is right in the heart of some of the top riding and offroad destinations in Southern California. Chaparral Motorsports started as a family motorcycle parts business in 1980 and now encompasses a 160,000 square foot footprint in San Bernardino, California. Recognized as one of the largest motorcycle dealerships in the country, Chaparral Motorsports offers a great selection of motorcycle parts, accessories, motorcycle gear, and motorcycle tires. 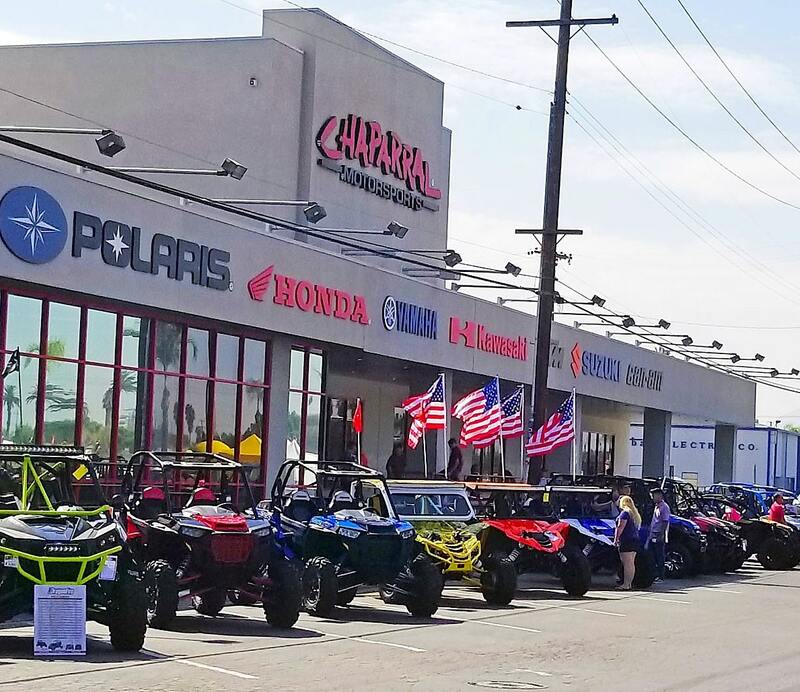 Over its 37 years in business, Chaparral Motorsports has developed into a multi-line motorcycle and ATV superstore, offering Honda, Yamaha, Kawasaki, KTM, Suzuki, Can-Am, Polaris, and Kymco ATV’s, motorcycles, side-by-sides and utility vehicles. For more information on Chaparral Motorsports, visit www.chapmoto.com.